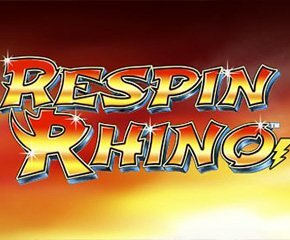 From the house of Lightning box, powered by NextGen comes a riveting slot game Respin Rhino. This slots game has various rewards up for grabs and grappling the players with its highly alluring special bonus features. 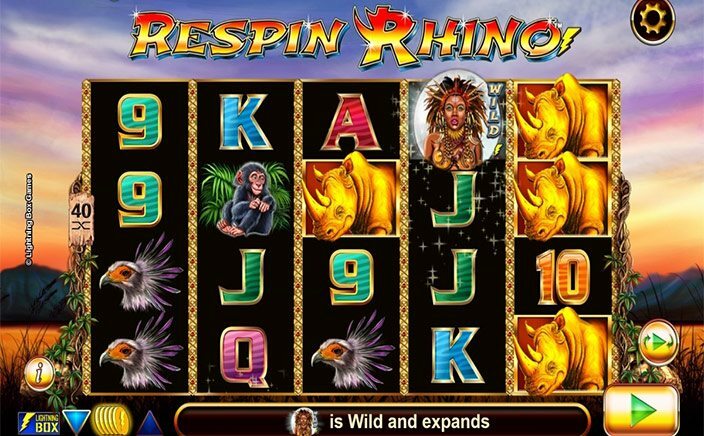 Respin Rhino has the classic theme of wildlife which is highly inspired by the jungles of Africa which transpires the players to dense thick forest life with its real life-like visuals. It is a 5 reel game which can be accessed to play online and is perfected to play on mobile devices with equal ease. There are 40 paylines grafted with symbols of creatures to be found in wild like elephants, tiger, eagles, and monkey staying true to its theme. There are lower value paylines as well which are inscribed with card icons ranging from 9 to A. A coordinating soundtrack helps the gaming experience to escalate one notch higher. The wild symbol comprises of a village woman and she will fill up any reels that she pops in. This makes combinations that will give rise to the possibility of taking home a sizeable bounty. You can grab really big when the golden symbols halt at the same position on the reels 1 to 5. The icons get transformed to rhinos and they stay jammed in that place while the other reels rotate for free three or more times. If you are lucky enough and the wild symbols appear, this sets in motion another round of free spin which can go up to as much as 9 respins. With increasing number of respins, your chance to nab huge score also surges. Respin Rhino slots game is captivating visually and alluring monetarily. Hence it provides a complete win-win situation for it players’. Not to forget about the beguiling sound score which aptly amplifies the mood of the game. Thereby making it a complete package that caters to every taste and makes it highly beneficial for a player. So it is a shout out to all the playing enthusiasts to try on their luck with this game. Who knows you may horn the rhino to set off the money flow.